NASA Television is providing live coverage of today’s U.S. spacewalk conducted from the International Space Station. The spacewalk is scheduled to begin at 7:10 a.m. EST and last about 6 hours and 45 minutes. 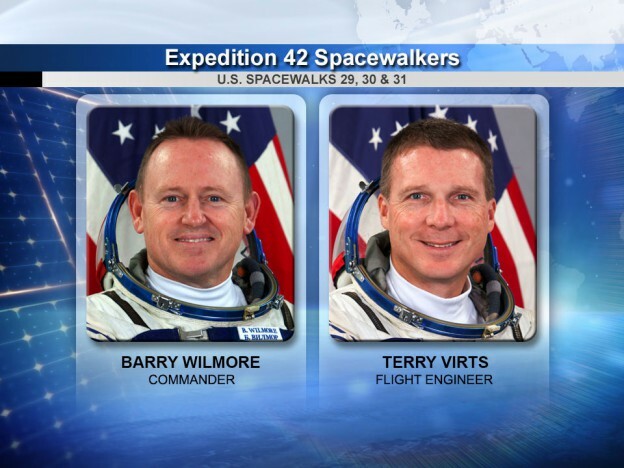 Expedition 42 Flight Engineer Terry Virts and Commander Barry Wilmore will venture outside the orbital complex for their third spacewalk in eight days. They will set up a series of antennas and communications equipment that will allow future crews launching from Florida on U.S. commercial spacecraft to rendezvous with the space station. Their work is part of a reconfiguration of the space station in advance of the arrival of private crewed spacecraft. During their previous two spacewalks, the duo spent about 13 and 1/2 hours outside the space station deploying cables, lubricating parts at the end of the space station’s robotic arm and preparing the Tranquility module for the relocation and arrival of other modules later this year. At the conclusion of Wednesday’s spacewalk, Terry Virts reported seeing a small amount of water floating free in his helmet during repressurization of the airlock. There was no report of water during the spacewalk itself, and the crew was never in any danger. After thorough analysis by ground teams, the space station’s mission management team gave a “go” on Friday to proceed with the spacewalk. Spacewalk specialists reported that Virts’ suit — serial number 3005 — has a history of what is called “sublimator water carryover,” a small amount of residual water in the sublimator cooling component that can condense once the environment around the suit is repressurized following its exposure to vacuum during a spacewalk, resulting in a tiny amount of water pushing into the helmet. A high degree of confidence was expressed that the suit’s systems are all in good shape and approval was given to proceed with the spacewalk. This is the 187th spacewalk in support of space station assembly and maintenance. Join the conversation on Twitter by following @NASA, @Space_Station, and the hashtag #spacewalk. To learn more about all the ways to connect and collaborate with NASA, visit: https://www.nasa.gov/connect. Tell me your real action on space!